A fun game created by a humorous author called Minecraft Flash welcomes players! If you expect too much wonderful features, Minecraft Flash cannot satisfy you. However, if you want to have a big fun, Minecraft Flash can give you. The target of this game is to explore Minecraft Flash world and have some fun with it. You start the game with 10 lives, and they can be lost if you hit a creeper. 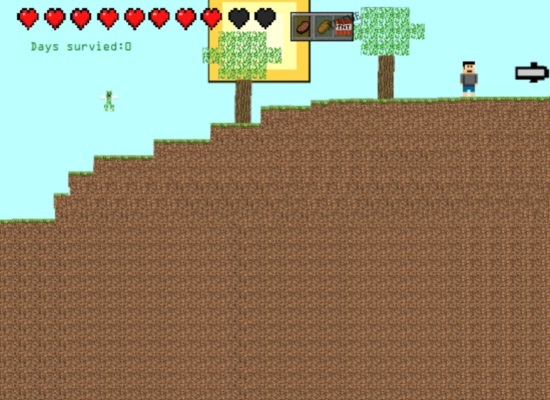 Amazingly, instead of walking on the ground or jumping up and down, the creeper in Minecraft Flash can fly. If you look at the top of the screen, you will see TNT in the inventory. Once you click into it, an explosion happens and the game ends. Minecraft Flash has different features from those in normal Minecraft games. Hence, how out finding what are differences? After playing Minecraft Flash, you can leave some comments about the game and say what you feel. If you have time, read other players’ comments. By the way, the author OF Minecraft Flash will reply to all players’ comments. Enjoy new fun experiences with Minecraft Flash! You use WASD to move and click into the Inventory in Minecraft Flash world.